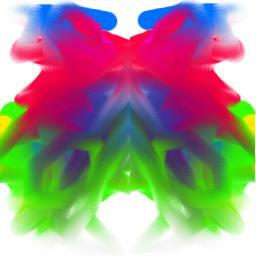 The best known projective psychological test is the Rorschach, or inkblot test. The patient is asked to look at each blot and to say what it looks like or what it could be. Because the stimulus is ambiguous, the patient must impose his or her own structure. In doing so, thoughts, feelings, and themes, some of which are unconscious, are projected into the material. Projective tests tend to have lower validity and reliability than objective tests. That is, they are less stable, and have lower relationships with other criteria. However, the information which they provide tends to be richer and more varied. The Rorschach test is particularly useful for detecting the types of disordered thought patterns seen in schizophrenia and other psychotic disorders. The scoring of this test takes into account the popularity of the patient’s responses, the content of the responses, whether the figures are seen as moving or stationary, response complexity, whether color or shading is used, and other factors. As with most tests, there are no single responses which are seen as necessarily pathological. Response frequencies and ratios are compared to normal and abnormal averages to determine if pathology or a particular tendency is present. Other projective tests include the Thematic Apperception Test (TAT), in which the patient tells stories about pictures, the Sentence Completion test, Draw-A-Person, and House-Tree-Person. The TAT is often used in a test battery in conjunction with the Rorschach. The TAT provides information about important themes in a person’s life or the content of their thinking, whereas the Rorschach provides information about the process and form of a person’s thoughts.